Map of Great Britain and Ireland. 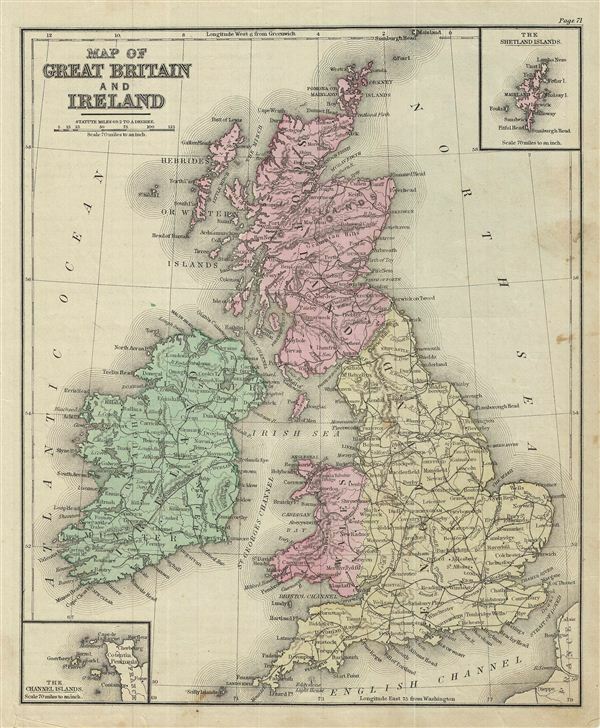 This is an example of David M. Warren's 1879 map of Great Britain and Ireland. It covers the British Isles from the Orkney Islands to Scilly Islands and includes the Hebrides Islands and Ireland. An inset in the top right quadrant details the Shetland Islands while another in the bottom left quadrant features the Channel Islands. Throughout, the map identifies various railroads, cities, towns, rivers, islands, mountain passes and an assortment of additional topographical details. The map is color coded according to regional and political boundaries with elevation rendered by hachure. Issued as page 71 in the 1879 edition of Warren's Common-School Geography.